Kurds usually avoid using the name Arbil in favour of the Kurdish name Hawler thinking that Arbil is part of the arabisation policy. Politically speaking, this fear is justified as Arabs have often tried to arabise anything which is not Arabic or to indulge in folk etymology (not scientific) to prove its Arabic origin. Kurds have often been subject to forced assimilation in all parts of Kurdistan under foreign control. The name Hawler was completely unknown to the outside world but has gained more currency since it became the capital of South Kurdistan. First of all, the name Arbil is not Semitic at all which means the Arab or even the Syriac-Aramaic claim can be categorically ruled out. 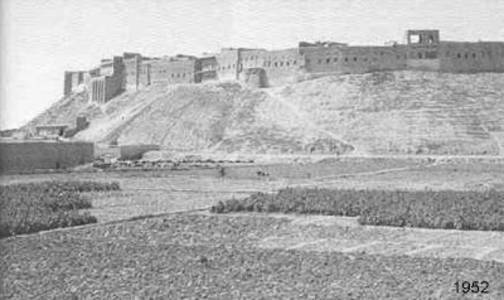 The name Arbil is much older and was mentioned in Sumerian (non Semitic language) holy writings (cuneiform texts going back to 3rd millennium B.C.) as Urbilum, Urbelum or Urbillum from Sumerian (Ur) meaning city and (bela) meaning high as the city is located in the upper area. The initial (ar) is found in a number of Hurrian (an Indo-European language) place names. Semitic people like the Akkadians and the Assyrians rendered the name again by means of folk etymology (arba´uu iluu) to mean (four gods) and became the city of worship of the goddess Ishtar. In Aramaic it then changed to Arbela and it became Arbairaa in Persian. The existence of variant forms of the name Arbil / Arbel / Irbil / Erbil (note Arabic does not have an e vowel), Arwil (Jewish) reflects the confusion in its origin. The Kurdish name Hawler is thought to have developed from the variant Arbel through a series of metatheses of consonants (re-aaranging of sounds and syllables which is frequent in Kurdish). Interestingly the initial (ar) in Arbil can also be seen as an abbreviation (a common feature of Kurdish) of Kurdish (shar: city) and the Sumarian bela (high) whether co-incidentally or not is similar, both in meaning and pronunciation, to the Kurdish (bala) which means high too. However, this etymological derivation needs more research as Kurdish have a variety of words which are pronounced in the same way - compare Shler (a flower and a name for women) and Diler (being of a courageous heart and a name for men) and other words like (kner).